Several Cadets and Colts members are garnering attention in their local papers for their participation in the upcoming Presidential Inauguration Parade in Washington D.C. Announced at the beginning of December, the two drum corps are among less than 100 groups selected from an applicant pool of nearly 1,400 to participate in the parade that will recognize U.S. President-Elect Barak Obama on Jan. 20, the day he is sworn into office. Inaugural parade performers stay on Kendall Green Gallaudet University (Washington, D.C.) published an article about the Colts who are practicing at the campus on Sunday and Monday for the Inauguration Parade. 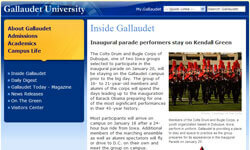 According to the article, the university was an ideal facility for the corps since Iowa senator Tom Harkin, a longtime friend of Gallaudet University, was a strong supporter of the Colts' inaugural parade application. Read the article on Gallaudet.edu. Park grads, student play in inaugural parade The South Washington County Bulletin of Cottage Grove, Minn., reported on two local residents who are making the trip with the Colts to perform in the Presidential Inaugural Parade on Tuesday. 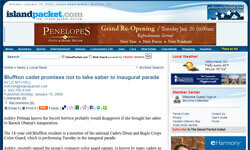 The article says the group will perform in front of an expected crowd of some 350,000 spectators along the parade route. Read the article on SWCBulletin.com. KP student, alumni to be in inaugural parade The Milford, Mass., Wicked Local Norfolk reported on four local residents who will perform with the Cadets during Tuesday's Inaugural Parade. Read the article on WickedLocal.com. 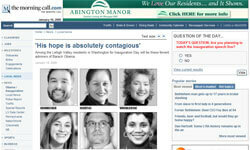 'His hope is absolutely contagious' Cadets assistant director Justin Heimbrecker is one of several local residents and Obama supporters featured by the Allentown, Pa. Morning Call. Heimbrecker, a Youth Education in the Arts employee, has been charged with coordinating the logistics for the 150 Cadets members who will participate in Tuesday's Inauguration Parade. Read the article at Mcall.com. Colts depart on date with history The Dubuque, Iowa Telegraph Herald reported on the sendoff of the Colts as their convoy of six buses carrying some 240 corps members and supporters departed for Washington, D.C. on late Saturday afternoon. Read the article on THOnline.com. 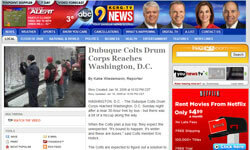 Dubuque Colts Drum Corps Reaches Washington, D.C. Dubuqe's KCRG-TV reported that the Colts made it safely into Washington, D.C. Sunday night, but not without one minor "hiccup" when one of the six busses transporting the group broke down in Pennsylvania. KCRG has sent a reporter and a photojournalist to cover the corps' trip to the Inauguration Parade. Read more and watch a video at KCRG.com. Bluffton Cadet promises not to take saber to inaugural parade Eighteen-year-old Bluffton, S.C. resident Ashley Pittman will participate in the upcoming Inauguration Parade in Washington, D.C. reports the Island Packet. Pittman, who is a senior in high school, has been a member of the Cadets since 2005. Read the article on IslandPacket.com. 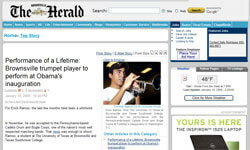 Performance of a Lifetime: Brownsville trumpet player to perform at Obama's inauguration Brownsville, Texas resident Erik Ramos will don the Cadets' classic maroon and gold uniform for the very first time during the upcoming Inauguration Parade. In November Ramos, 19, was selected as a first-year member of the Cadets and found out only a few weeks later that he would have the opportunity to perform with the group at the parade. Read the article at BrownsvilleHerald.com.